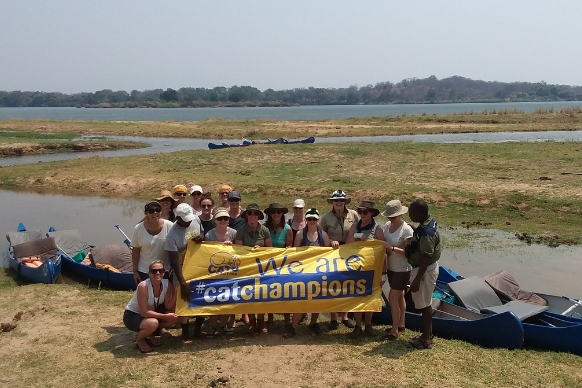 We are offering you a once in a lifetime opportunity to join fellow cat lovers on a three-day canoeing challenge on the mighty Zambezi river. 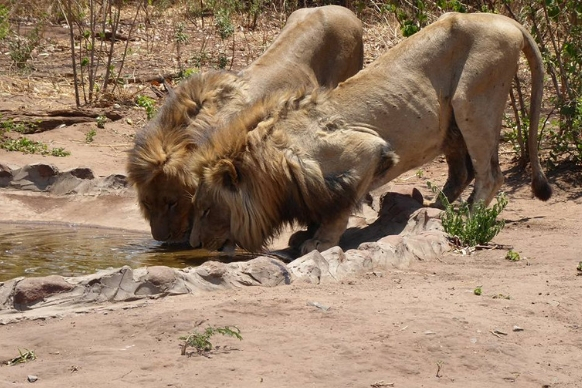 You will then learn about lion conservation on a one-day visit to a project in Livingstone and join four safari drives to try to spot lions in the wild, along with other wild animals. We understand the commitment, courage and thought that goes into participating in a challenge event on behalf of Cats Protection and promise we will do our very best to give you all the help and support you need to have a successful challenge and raise lots of much-needed funds to help us care for cats and kittens. We will also provide you with a dedicated Facebook group to network with fellow cat loving participants and a branded yellow Cats Protection tech top to fundraise in. Plus ideas, resources and support to help you fundraise. Please note: By ‘signing up’ below you are committing to your event place and are able to start fundraising etc. You will not pay your registration fee on this link; you can schedule and arrange payments via the form. The form will take around 10-15 minutes to complete. 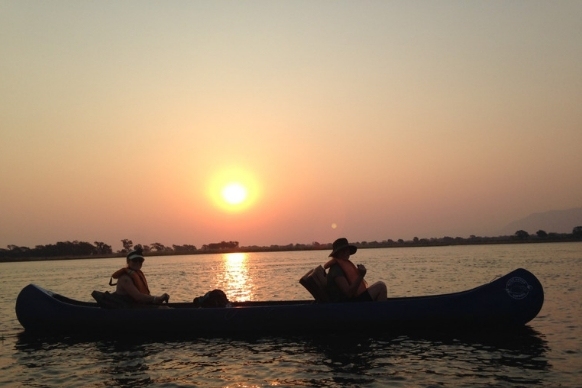 After a good night’s rest you will spend three further days canoeing the Lower Zambezi River, the territory of wild crocodiles, hippos and elephants. Travelling through Zambia by water is not only a great personal challenge, but it gives you a unique perspective on the country’s natural beauty, landscapes and wildlife. After completing your canoe expedition you will transfer to Livingstone, home of Victoria Falls, where you will stay for the next two nights. You will take a visit to the lion conservation project where you will spend the day learning about their conservation efforts and activities throughout Africa. On the way back to Livingstone you will take a visit to the magnificent Victoria Falls. 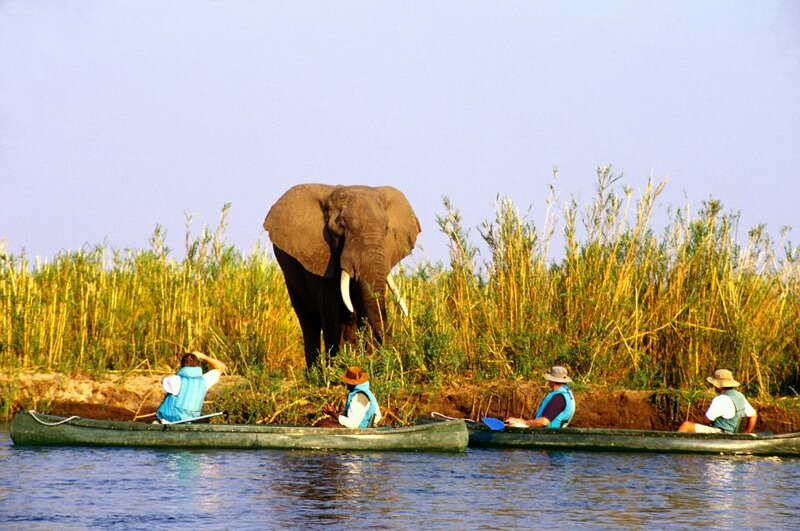 The next day you will transfer to Botswana to spend two days visiting the superb Chobe National Park. Over the two days you will take part in two game drives and a river cruise, giving you three fantastic opportunities to spot a wide range of wildlife. Arrive in Lusaka where you will be transferred to the Lower Zambezi (approx. three hours) to freshen up, meet the local team for a safety briefing, pack your bags and commence the canoe expedition. 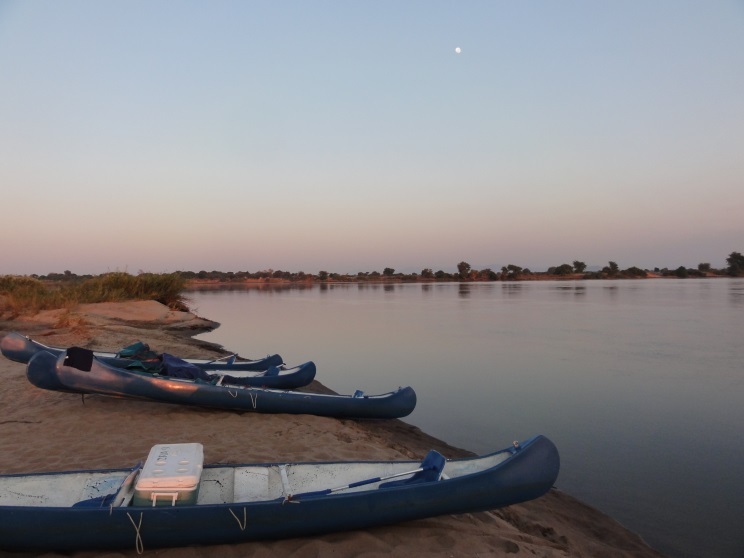 You will spend three full days on the river in this spectacular natural landscape, paddling downstream each day under the heat of the African sun, and occasionally pulling in to walk along the river bank to spot more wildlife. The days are long so you are advised to have a good level of general fitness, although no previous experience is required. As you wind your way down the river, home to a wide variety of wildlife, keep your eyes peeled for elephants, hippos and crocodiles. It is also possible you will spot buffalo, giraffe, the occasional zebra and wildebeest, and if you’re very lucky you may spot a lion or a wild dog. Each night you will camp in tents on the river bank or on small islands for a truly wild African adventure. Today we travel to Livingstone (approximately eight hours’ drive, with plenty of stops en-route) and check into Jollyboys, our home for the next two nights. Day 7 (Thursday 20 August 2020): Livingstone – Lion Conservation – Victoria Falls. 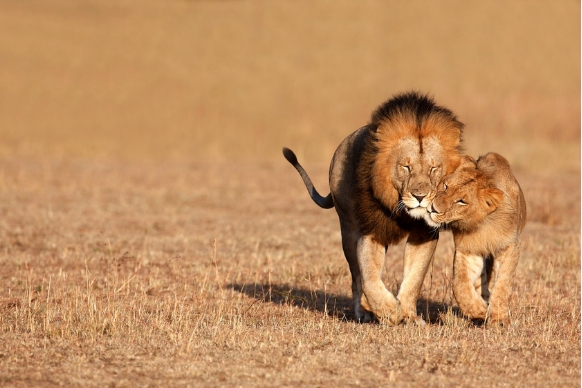 Today is an early start for your visit to the Lion Conservation project. The visit may be at either the Zimbabwe or Zambia branch (this will be confirmed before departure). You will spend the day learning about the projects work in lion conservation throughout Africa and find out more about the plight of big cats in the region. On the way back to your accommodation you will take a visit to Victoria Falls, locally known as Mosi oa-Tunya which means ‘the smoke which thunders’. This 108m vertical chasm is a sight to behold, and one of the seven natural wonders of the world. Today you have an early start as we drive to Botswana (approx. 1.5 hours) to spend the next two days in the magnificent Chobe National Park. 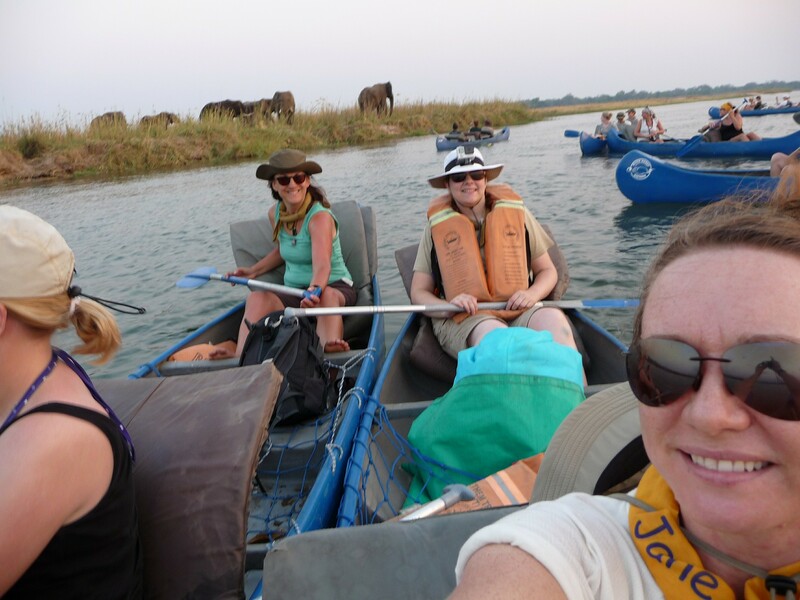 Once you have completed your border formalities you will start the day with a three hour river cruise along the Chobe River, famous for its large herds of elephant and buffalo. Look out for baboons and other primates, the stunning fish eagle, goliath heron and openbill stork. After lunch you will go on an afternoon game drive (10 people per vehicle), where elephants, giraffe, buffalo, zebra and hippo are abundant. 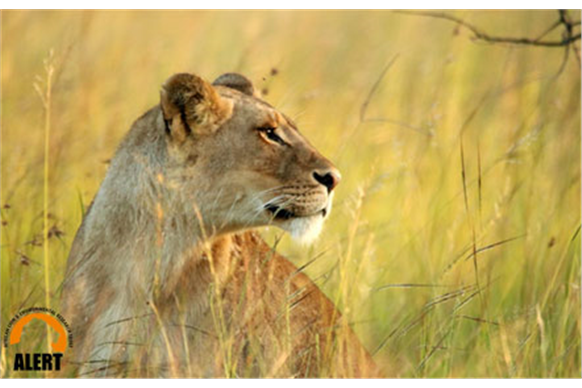 It is also common to spot lions and, if you’re lucky, the occasional cheetah or leopard. 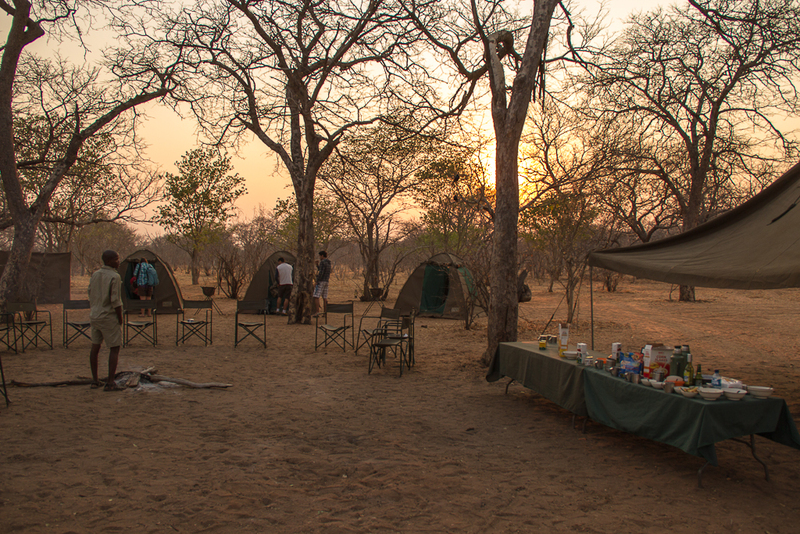 After an exhilarating day you transfer to your campsite where your guides and camp cook will prepare a hearty dinner before settling in around the campfire and listening to the sounds of Africa with your team mates. Today you have another early start as we take another game drive before saying farewell to Botswana and transferring back to Jollyboys for our final night (approx. 1.5 hours). The rest of the day is at leisure. You depart Livingstone today and transfer back to Lusaka (approx. six hours’ drive, with plenty of stops en-route). You will arrive at Eureka Lodge this afternoon. Eureka lodge is located on private game park and with wildlife inhabiting the area, it is not unusual to walk around the grounds and spot a giraffe, zebra or herd of impala. NB Adventure travel can be unpredictable so this itinerary may change due to unusual weather patterns, wildlife movements, and the ability of the group and so on. We will do our best to keep to the set itinerary however we cannot be held responsible for changes that might occur outside of our control. In all such circumstances your guide and tour manager will have the final say in the interest of the health and safety of the group. You will be accompanied by professional English-speaking, first aid trained guides, and support staff. You will also be accompanied throughout by a first aid trained UK tour manager, and Cats Protection staff member. The area of the Lower Zambezi River you will visit is quite wide with tree-lined sandy banks either side. August, the dry season, is a good time for animal spotting on the banks of the Zambezi as the inland streams start drying up and animals travel to the river bank for water. 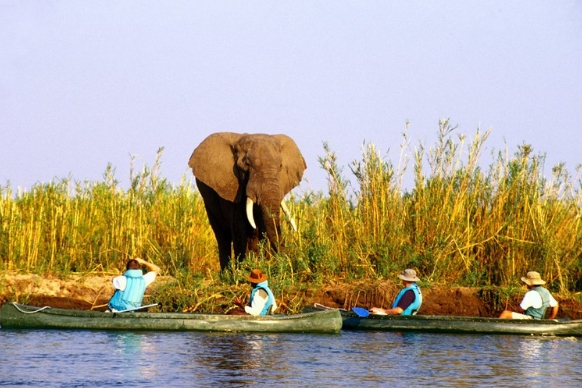 As you paddle downstream you are likely to spot plenty of elephants, hippos and crocodiles. Don’t worry; your local guides will navigate you through the river so you can admire these incredible creatures without disturbing their territory. It is also possible you will spot buffalo, giraffe, the occasional zebra and wildebeest, and if you’re very lucky you may spot a lion or a wild dog. The Zambian sunrise and sunsets are immeasurably beautiful and the entire landscape changes colour as the sun moves through the sky, reflecting off the calm waters. August is a great time to visit Zambia. It is the middle of the dry season and the coolest month to visit. Temperatures range from 23-27°C during the day and drop to around 0-8°C at night so it’s important that you bring warm layers for the evenings. The weather should be dry and calm with low water levels on the river. Although the temperatures and conditions above are historically accurate, climate change can impact the seasons so you may experience uncharacteristic conditions during the trip which are out of our control. Should this happen the guide will assess the situation and make decisions to ensure the best enjoyment and ultimately safety of the group as a whole. I’ve never canoed before, can I join? No previous canoeing experience is required (although this would be a bonus) but a good level of general fitness is recommended as the days can be long and tiring. Life jackets are supplied. You will paddle approximately 12-28km per day on the river but there are some leisurely stretches where you can soak up the sights and sounds of Africa. Occasionally you will pull in and walk along the shore, looking out for animals along the way. The water levels on the river stay fairly consistent due to regulation by upstream reservoirs and there are no rapids to contend with. The trip is graded moderate to challenging due to the long days canoeing, basic camping conditions and wide ranging temperatures. What about the daily routine? You will be given a thorough briefing on what to expect before you commence your canoe expedition. The typical day will start with an early wake-up call with tea or coffee and biscuits. You will then set off downstream so you can take advantage of viewing the animals when they’re most active. You’ll pull in for breakfast before continuing to canoe towards a sheltered spot for a long lunch to avoid the heat of the day before heading to our overnight spot to set up camp and help prepare dinner. Evenings are often spent around the camp fire telling stories and getting to know one another. It’s also a great opportunity to reflect on the day, enjoy stargazing or write a journal. During the canoe expedition, camp will be set up each night on the banks of the river, or on small islands. 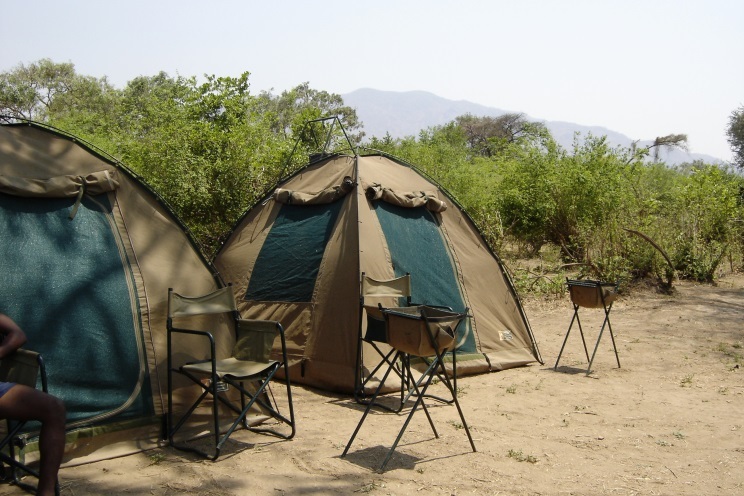 You will share two-man tents (two to a tent) which have incorporated mosquito netting. Sleeping bags and thin sleeping mats are provided but you may bring your own mat, for extra comfort. During your days in Livingstone you will stay at a Jollyboys Backpackers lodge (twin or triple share rooms with shared bathroom facilities), you will camp overnight in tents at Chobe National Park (two to a tent) with mats and blankets provided, and you will stay in small huts at a Eureka lodge in Lusaka on the final night (twin or triple share with en-suite bathroom facilities). What about toilets and hygiene? During the canoe expedition, water will be drawn from the river for washing. You are recommended to bring environmentally friendly shampoo and soap products to keep pollutants to a minimum. Lush (www.lush.co.uk) products are worth considering. Toilet facilities comprise a hole dug into the ground with a small privacy tent. You should bring your own supply of toilet paper and a small pack of baby wipes for general hygiene throughout the day. Used toilet paper must be packed away into a nappy sack or similar and disposed of in the bin at the campsite; toilet paper (and other litter) should never be left on the ground. The canoes are two-man 18-foot Canadian-style fibreglass canoes with containment nets and ropes to ensure both group gear and personal belongings are secure at all times. Each canoe has five buoyancy chambers, while the bucket seats are foam cushioned allowing a reasonable level of back support. Single bladed paddles are used and life jackets supplied. Anything you need for the canoe trip should be packed into a soft holdall which will be packed into a dry bag (provided). Any luggage not required for on the river (large suitcases, hairdryers etc.) will be stored securely. A kit list will be provided on registration. The day starts with hot drinks and biscuits then after several hours canoeing you will stop for breakfast which will comprise produce such as eggs, pancakes, fruit, toast, bacon, sausages etc. with more hot drinks. Lunch will be an assortment of cold meats, salads, breads and cheeses and dinner will involve a main meat dish with vegetables and potatoes rice or pasta. Dietary requirements can be catered for if we are notified in advance. There is always plenty to do at meal times so get involved and help your guides with preparation. The minimum age is 18 (or 16-17 if accompanied by an adult). There is no upper age limit. An ideal candidate would be someone who enjoys being out of their comfort zone, likes to try new things, has a good level of fitness, is healthy and determined and has a flexible and open minded personality. You should arrive in Zambia with a good fitness level to ensure fast recovery from each day’s exertions. Fitness training such as hill walking, swimming, running, cycling, gym workouts, team sports and boot camps etc. are all excellent ways to increase your fitness. Building your core and upper body strength will benefit you greatly, so you are recommended to include resistance workouts (such as push-ups, squats, planks, lunges, triceps dips, bicep curls etc.) into your routine. These exercises can be done at home without any specialist equipment. You can download a number of free apps which will help you train and track your progress. E.g. MapMyWalk, C25K (couch to 5k run), MyFitnessPal etc. Attempting to complete the trip without training may hinder your experience, and the experience of your teammates. We require a medical form to be completed by everyone upon registering, and any pre-existing conditions, medications used and other medical issues must be noted. Any conditions that develop must be declared and if required, a new medical form completed and signed. To sign up you will pay a non-refundable registration fee of £360. This may be payable in up to three instalments. Once your place is confirmed you can start your fundraising which is a minimum pledge of £4,800 for Cats Protection. This figure is in addition to the £360 registration fee. You will also need to budget for airport taxes and fuel surcharges not included (currently approx. £330). See below for inclusions and exclusions. • Personal expenses such as drinks, souvenirs, tips etc. Is the trip ATOL protected? When you book you will be financially protected by the ATOL scheme. When you pay you will be supplied with an ATOL Certificate. Please ask for it and check to ensure that everything you booked (flights, hotels and other services) is listed on it. Please see the booking conditions for further information or for more information about financial protection and the ATOL Certificate go to: www.atol.org.uk/ATOLCertificate.